Cars kill people. More than 37,000 over the course of 2017—what would statistically be considered a ‘good year.’ Big tech has a solution: Have the cars drive themselves, free of the distractions, drunkenness, and other human foibles. Flood the roads with autonomous vehicles, and watch collision deaths plummet. Too bad this lovely narrative has a major plot hole: Blunt force trauma isn’t the only way cars kill. Each year, hundreds of thousands of people die prematurely from breathing exhaust-poisoned air. Even more insidious is how the mere act of sitting in a car for an hour or so each day drastically increases peoples’ risks of developing life-altering—sometimes life-ending—conditions like obesity and heart disease. 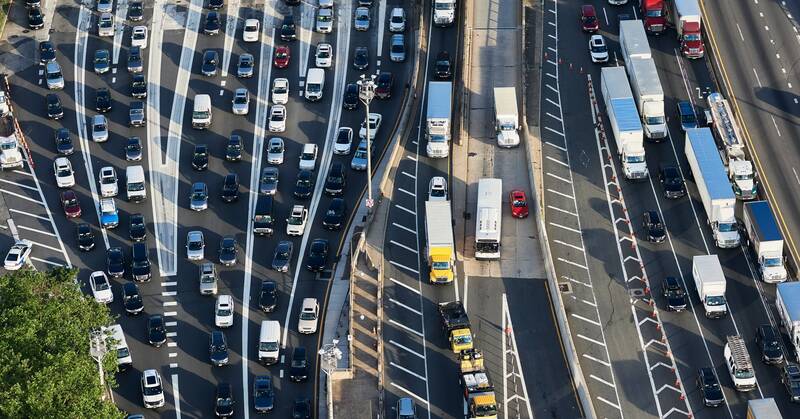 A widespread shift to vehicles that drive themselves, some experts say, could weaken humanity’s already slipping stance in a two-front war against pollution and sedentary behavior. They worry that once the stress of traffic and overt dangers of car travel are gone, people will spend more time in their rolling barcaloungers. And just because cars drive themselves doesn’t mean they’ll all be battery-powered, or that they’ll somehow inspire their occupants to get active. The only way to ensure the chauffeured masses don’t reach their final destinations far too soon is to address the automobile era’s original sins. Sins that aren’t rooted in who’s working the pedals. Now, pollution and sedentary behavior are nebulous things, each with a variety of causal factors. But want to hazard a guess at what is one of the biggest contributors to people breathing bad air and not getting enough exercise? That’s right: spiders. Seriously, though, it’s cars. Numerous studies have linked traffic to air pollution, in the form of lung-spackling poisons like particulate matter, volatile organic compounds, carbon monoxide, and nitrogen oxide. Not even homebodies are safe, as vehicular belches can waft indoors. Motor vehicle pollution is so bad that EPA warnings about it survived Scott Pruitt’s information purge. At the same time, car commuters tend to live more sedentary lives, and as a group experience elevated rates of obesity, diabetes, and heart disease. “Although people think these risk factors are individual behavior choices, the reality is that our choices are shaped by our environments,” says Karen Lee, a physician and associate professor of preventive medicine at the University of Alberta in Canada. Over the course of the 20th century, vehicle ownership made it possible for people to work in cities without having to live in them. Personal chariots begat the personal fiefdom, which begat urban cores surrounded by ever-thickening rinds of suburbia. So, for many people, walking is no longer an option. Sprawl makes public transportation untenable: You’d need too many buses, or too many miles of rail, to service all that acreage. The ironic twist of the personal freedom cars enabled is they required everyone make the same choice: Get a car, or get bent. “Why do we care about safety?” says Peter Norton, a transportation historian at the University of Virginia. “Because we care about human health.” Norton warns that the autonomous future will result in less walking, more sprawl, and—without dedication to electric propulsion—a huge spike in pollution. “When your car drives itself and you can spend the commute doing whatever you want, who cares if a trip that used to take 20 minutes now takes an hour?” he says. It doesn’t have to be this way. In November 2017, a British parliamentarian laid out a proposal to clear away any impedimentary regulations, and invest £1 billion in self-driving technology, so the nation could have autonomous vehicles on its roads by 2021. This plan had some notable oversights. Early proposals focused on benefits, like how people would have so much more time to work during their commute, and how that might benefit the economy. “I was concerned about how the supporters of this plan focused on productivity,” says James Harris, a policy and networks manager at the Royal Town Planning Institute in the UK. Harris encouraged his country’s transportation planners to look at how autonomous transportation might worsen public health. Or, how it would change land use patterns, by encouraging Brits to move farther and farther from the places they work, shop, and recreate. So, how to deploy a potentially life-saving technology without exacerbating already serious public health problems? Maybe by skipping cities. Allowing vehicles into urban areas in the first place was one of those original sins. Cars foul the air, don’t move enough people, and rob funding and space from transportation modes that make sense here, like buses with dedicated lanes, bicycle infrastructure, and safe-to-cross streets for pedestrians. Autonomous vehicles might make the most sense in the suburbs and on highways. First of all, because this is where the majority of road fatalities occur. And while they wouldn’t roll back sprawl, they could at least, if connected to public transit, make city-bound suburbanites spend some time on foot—going from the curb to the train, from the train to work—which could make a dent in the epidemic of preventable lifestyle diseases.